Today I have another really quick DIY spray to share. I think your hair will LOVE it! My hair drinks this up and is super soft afterwards, moisturized, shiny and it actually helps to refresh my curls too! I use this spray in different ways (you can apply this on your scalp and face too btw, who doesn’t love a good 3 in 1 product right)?! Water – the ingredient of life right? H2o is a naturals best friend as it hydrates the hair, restores lost moisture, provides elasticity to the hair, helps prevent breakage, honestly water should be our closest buddy. 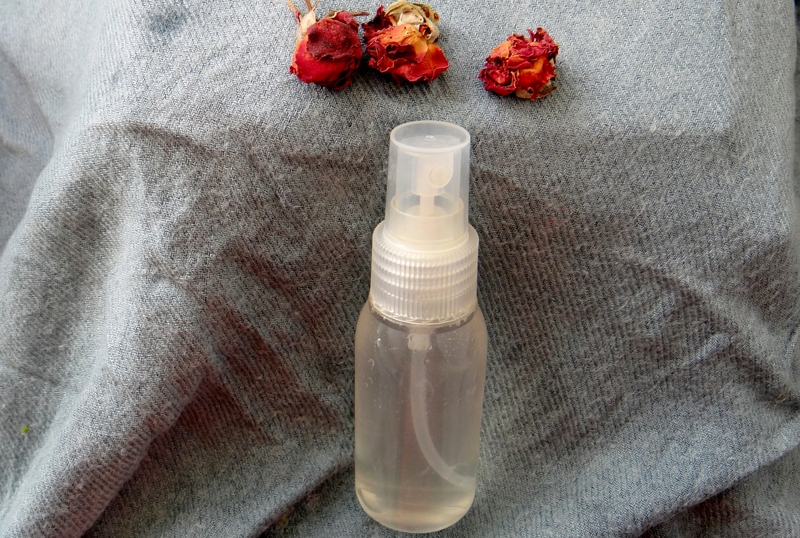 Rose Water (apart from smelling AMAZING) – it is known to help revitalize the quality of your hair due to Its natural moisturizing and nourishing properties. It helps ease scalp irritations or dandruff, it leaves the scalp feeling fresh, is said to help reduce hair loss due to the fact that it helps stimulate hair follicles, provides shine and helps restore the natural pH of the skin and hair. Aloe Vera Juice (AVJ)* (Fresh or store bought) – promotes hair growth, stop hair loss, treats scalp problems e.g. dry/itchy scalp. It restores moisture to both the hair and scalp, helps simulate hair growth since it contains enzyme that stimulates hair follicles and can help reduce buildup since it has astringent properties. *If you are using AVJ directly from the plant (completely pure and untreated) it is best to do a skin patch test to see if you are allergic to it first since people can develop an allergic reaction to it. Vitamin E Oil – a commonly used oil to help extend homemade products shelf life (however only extends products for a little bit). It rejuvenates and offers protection for the scalp and skin by nourishing both and is said to help sooth scalp issues such as psoriasis*. The oil helps to condition the hair resulting in healthier and shinier hair. *Should you suffer from psoriasis it is best to consult a medical professional e.g. a dermatologist or your personal doctor as this is NOT a cure for psoriasis. Essential Oil (EO) – depending on the EO you use you can get different benefits my suggestion is peppermint, tea tree or rosemary but you can use any EO of choice. (I prefer to skip this because I LOVE the scent of Rose Water). Depending on how my hair is styled, I will either use it to freshen up my curls in the morning, spritz it on an old wash and go or even to remoisturize my hair at night before putting in twists (after sealing with a little oil). What I love about this is that the mix is really light weight so even if you spray this on “old hair” it will not weigh down your curls, it is super moisturizing thanks to the ingredients and of course it is all natural! The recipe is simple to do so it won’t take you long to remake it. I do suggest making small batches to ensure it stays fresh since there are no preservatives added. I do recommend storing it in the fridge just to make sure it doesn’t go off too quickly and since it is easy to make it won’t take you any time at all! I would love to hear what you think about this mix! This entry was posted in DIY Curl Activating Spray, DIY Curl Refreshing Spray, DIY Hair Moisturizing Spray and tagged aloe vera juice spray for hair, Curl Activating Spray, Curl Refreshing Spray, DIY Curl Activating Spray, DIY Curl Refreshing Spray, DIY Moisturizing Spray, Moisturizing natural hair, natural hair care, natural hair rose water spray, Natural moisturizing spray, Rose water spray for hair, Spray for natural hair on June 24, 2015 by Maicurls. Trying this right now. I am only missing rose water. But I have some EO. Can’t wait to see how it works! Hello, I love the ingredients in this refresher and I have them at my house could this work on wavy hair? I’m looking for options since water, conditioner, and oil doesn’t help me much. I am sure it will be fine on your wavy hair. I would just scrunch your hair a little after you have applied the spray going from ends to roots scrunching in an upwards direction. Would love to hear what you think after you have used it. A MILLION THANK YOUS, SMILES and HUGS to all my Natural Hair Blog Feature Participants from January to June 2015. All of your hard put into your posts has helped so much and have served as an inspiration to all my viewers, me included. So here is my way of saying, thank you so much, loved working on your posts and wish you the best today, tomorrow and always. Thank you our Lovely Queen Marianne. My next hair spritz, gotta finish the one I have now, so in 2 weeks will be doing this one, thank you darling, I just loveeee your ideas, because 1. They are easy to do, 2. Thegy really do work 3. When a Queen suggests something, do what she says 😀 😀 :D, you are awesome!!!!!!!!!!!!!!!!! !